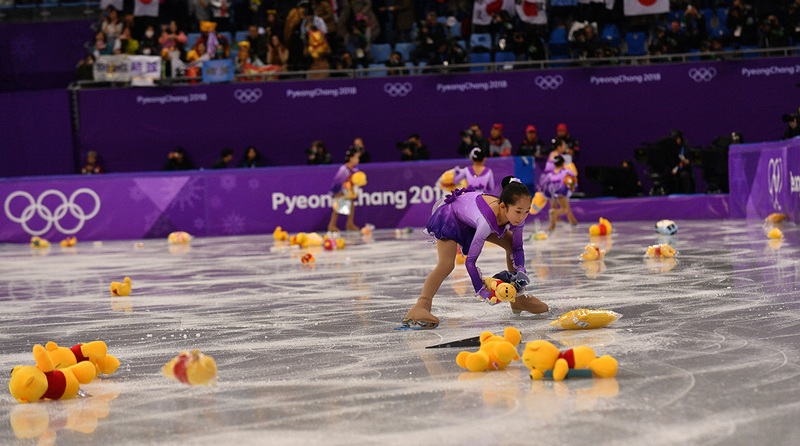 Japan's Yuzuru Hanyu landed an impressive score and tons of applause as the ice was flooded with bears. Thursday's forecast called for the men's figure short program in Pyeongchang called for a ... heavy shower of Winnie-The-Pooh bears? A swarm of flower girls rushed on and off the ice to pick up the bears, struggling to keep up with the steady stream of flying fluff. So just why did fans resort to the Hundred Acre Wood's favorite bear? Hanyu would place a Winne-the-Pooh tissue box cover on the rink's boards as a good luck charm when he was younger, and it's remained a mainstay. It even has a Twitter account. Fans have since taken to throwing the bear as symbol of support. Even former Olympian Ashley Wagner knew what was coming.